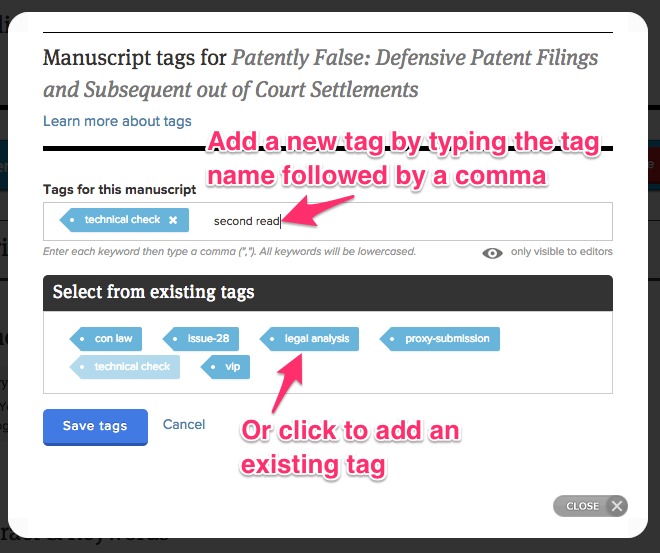 Scholastica | How do I add tags to a manuscript? After you've finished adding tags, click "Save tags" to commit your changes. The assign tags bulk action allows you to assign tags to all of the selected manuscripts at once. Simply select the manuscripts you want to tag from the manuscript table, choose 'Assign tags' from the bulk manuscript actions menu, and then assign one or more tags and click save. For more information on bulk actions, please click here.